You want your college dorm room to be comfortable and feel like a home away from home. You have the perfect dorm essentials picked out on your college dorm checklist for your dorm room throughout the college year, but don't forget about the holidays. Holiday dorm room decorating is just as important as the dorm room decorations you keep in your college dorm room year round. Why? Think of your home during the holidays - it's a pretty cozy environment, right? Who wouldn't want that level of comfort in their college dorm room during the holidays! With our 3'x20" Kodiak Mini Tree with Italian Mini Lights, you can make your college dorm room perfectly comfortable and a little home for the holidays. Our 3'x20" Kodiak Mini Dorm Tree is perfectly sized to not take up a lot of dorm room space. This dorm space saver is taller than it is wider, allowing you to maximize the amount of holiday decorations you can place inn your college dorm room. Plus this dorm necessities item is super cute! 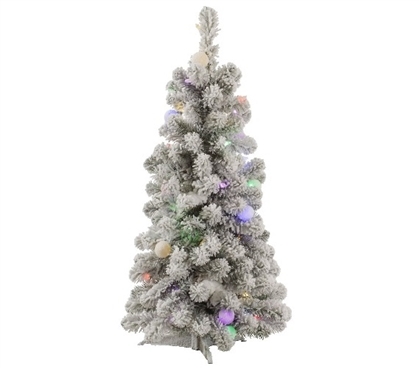 This college supplies item features white frosted branches to look like this dorm Christmas tree was sitting outside collecting snow and looking utterly adorable while it's at it. Plus this dorm item already comes with the holiday decorations you would add to it. Featuring a string of dorm mini lights and multi-colored larger lights in a plastic base, this cute tree will add even more pretty elements to your dorm room decor.